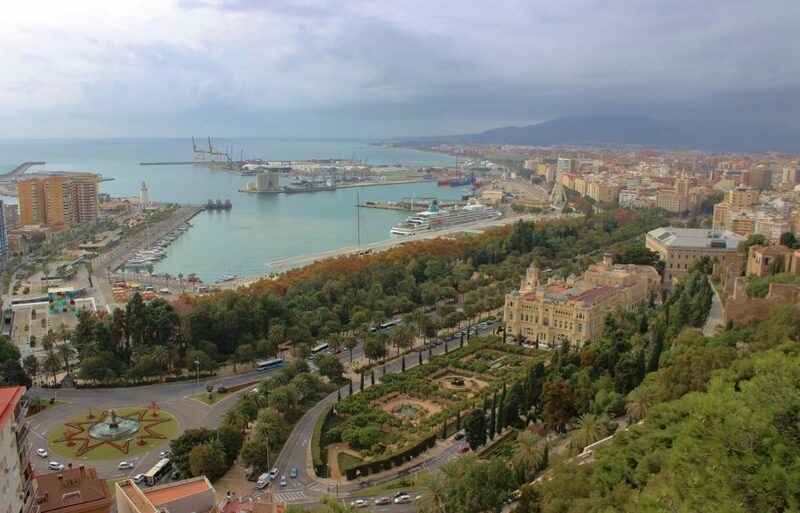 Malaga was a big surprise to me. 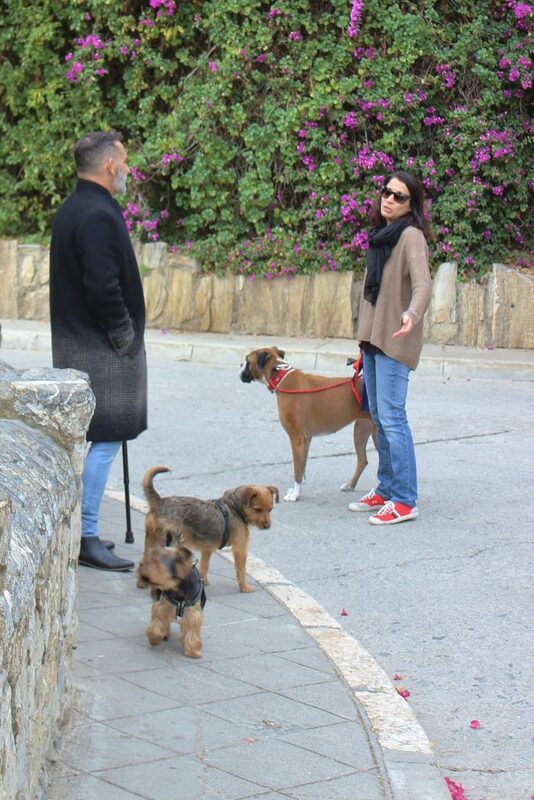 Leo was intrigued by the city having heard good reports from his parents because of its picturesque location on the Mediterranean surrounded by mountains. The Guadalhorce River that runs through the city divides the Sierra de Mijas mountain range which we see here to the west of the city and the Montes de Málaga to the east. 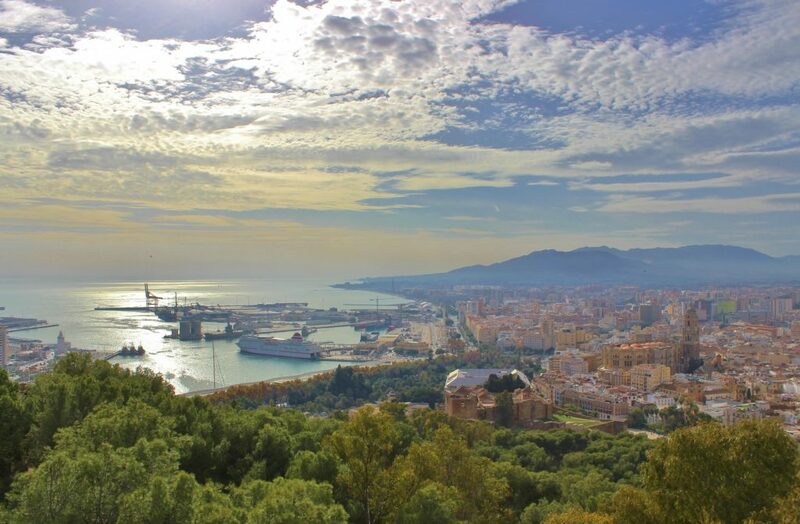 This photo is taken from the summit of mount Gibralfaro where we were staying at Parador de Málaga overlooking the city and its busy port. This is one wing of Parador de Málaga and our room was at the far left high above the city with the incandescent Mediterranean Sea stretching out beyond the horizon. The Parador hotel chain is the Spanish national system of elegant hostelries scattered across the country designed to promote tourism. 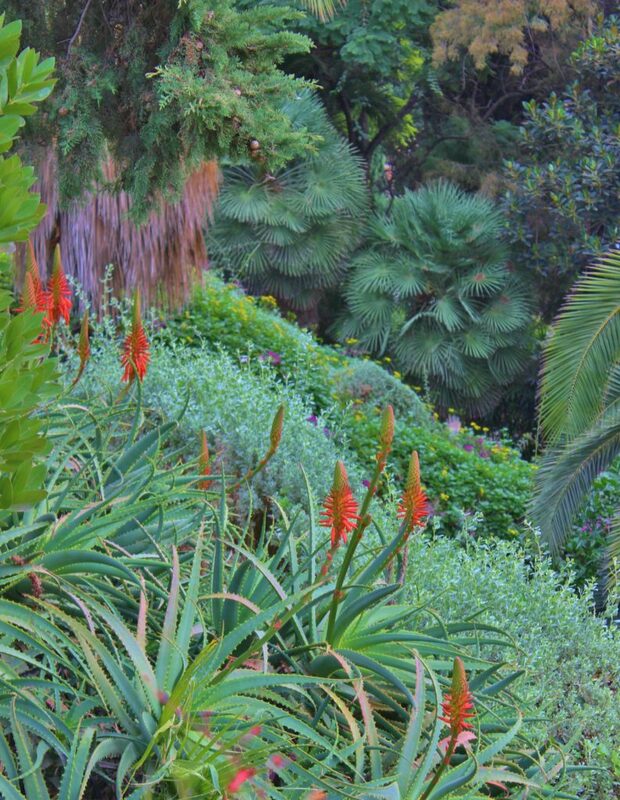 All of the Paradors enjoy spectacular locations in historic and or traditional style buildings. 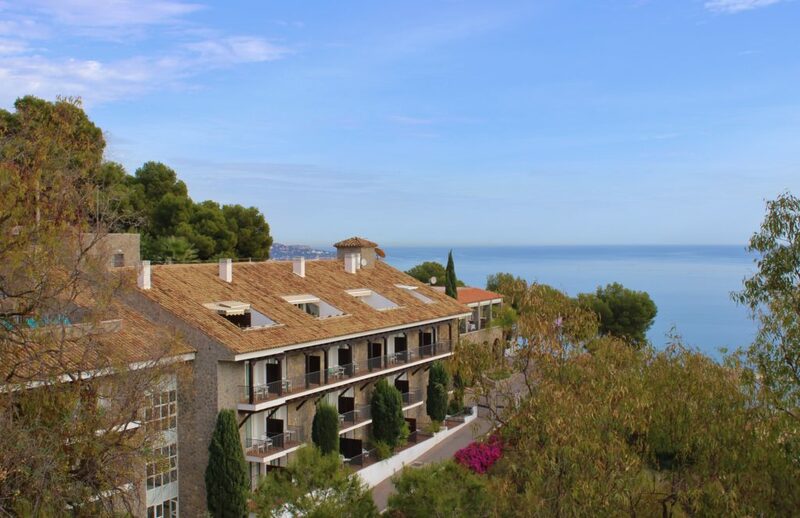 Parador de Málaga is nestled into the surrounding pine forest of Mount Gibralfaro and has easy accesses to a system of pedestrian paths meandering through the trees and down to the city with charming views of the surrounding landscape and sea. Directly above the Parador is the Castillo de Gibralfaro originally part of a Phoenician lighthouse. 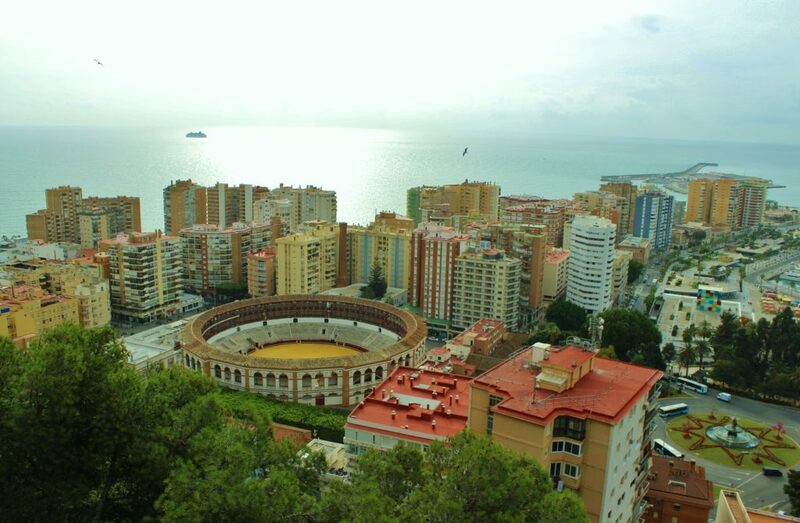 This is a view from our principal balcony overlooking the seaside neighborhood of Plaza de Toros enthusiastically squeezed by modern apartment towers. You can see the shimmering Mediterranean where a cruise ship sails out on its nervous progress to the next port of call. 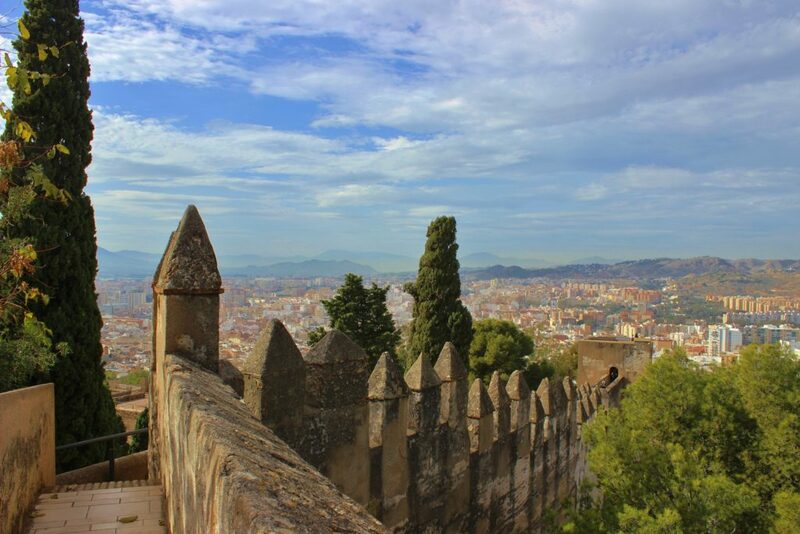 It is an easy walk from our hotel up to Castillo de Gibralfaro and we enjoyed exploring the picturesque ramparts with their distinctive pyramidal points atop the merlons of the outer walls. The Castillo crowns Mount Gibralfaro giving views in all directions. Here we are looking inland across the city and all the way out towards the Sierra de Mijas Mountains in the distance. The castle was built in 929AD by Abd-al-Rahman III, Caliph of Córdoba, on a former Phoenician enclosure and lighthouse, from which its name was derived – gebel-faro (Arabic and Greek, meaning rock of the lighthouse). Yusef 1, Sultan of Granada, enlarged it at the beginning of the 14th century, also adding the double wall down to the Alcazaba. The castle is famous for suffering a three-month siege by the Catholic monarchs, Ferdinand and Isabella, which ended only when hunger forced the Malagueños to surrender. Afterwards Ferdinand occupied the site, while his queen took up residence in the town. It was in use as a gunpowder arsenal and military base by the Spanish government until 1925. 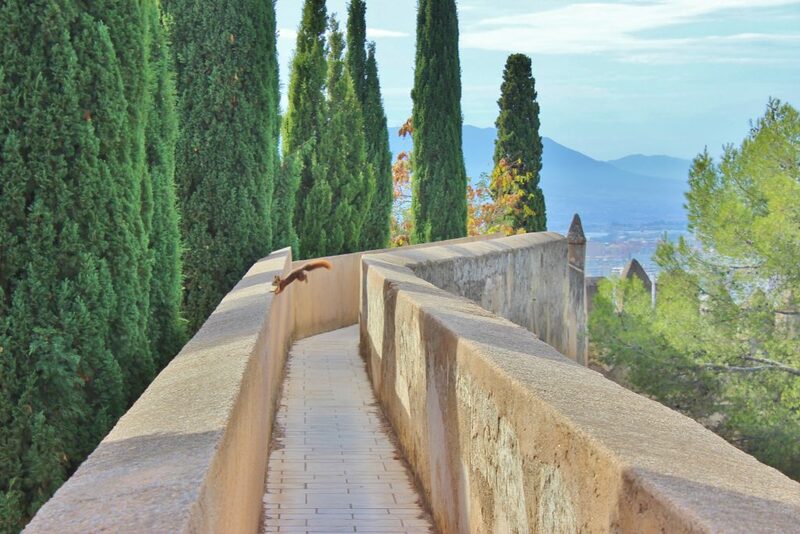 One of the permanent residents of Castillo de Gibralfaro, a red squirrel, gracefully leaps over the ramparts on his way home in the towering Cypress standing guard within the ancient fortress. 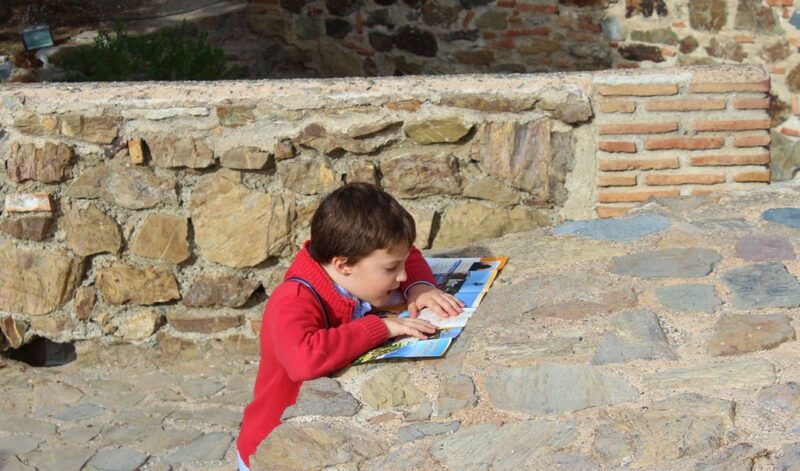 A studious young visitor to El Castillo consults his map guide, making sure he and his family have not missed any of the exciting sights. 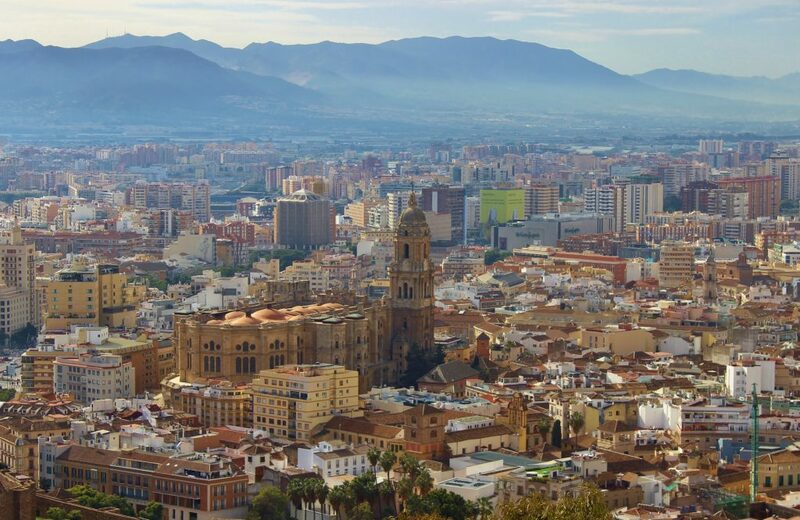 The most important monument of Malaga is the cathedral seen here from the El Castillo de Gibralfaro affectionately nicknamed “La Manquita,” loosely interpreted as “one-armed woman” because only one of its intended two towers was completed. 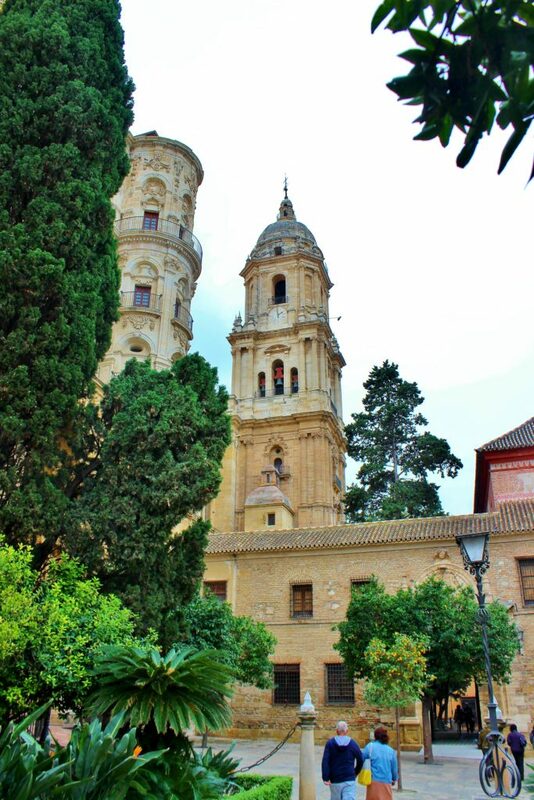 Quite frankly after trudging around Spain for the better part of three weeks and then landing in the incredibly comfortable and luxurious Parador de Malaga I was hesitant to leave the confines of our hotel. 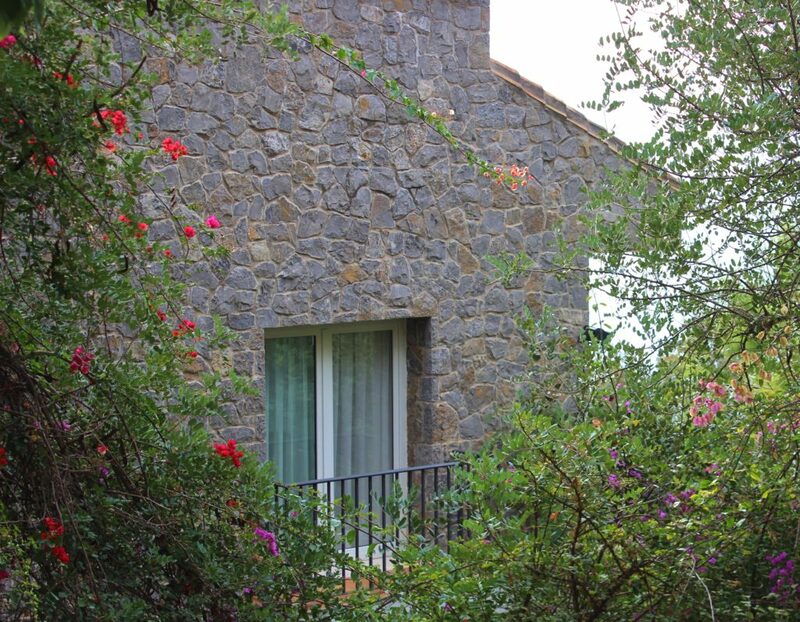 Especially after exploring the Castillo directly next door and enjoying a delightful luncheon at La Terrazita Café comfortably positioned within the Castillo gardens with great views out onto the Mediterranean. I thought I might as well take advantage of the huge bathtub of our room and plunge into the steamy perfumed suds of a bubble bath, hey, our suite was overflowing with all these cool and groovy bathroom amenities, so why not dive in? However, the next day after an absolutely lux breakfast buffet on the second floor balcony of the formal dining room, yes this is the view from that perch, we decided that we could gather our energies and trundle on down to town on the winding pedestrian path that would take us to the town hall surrounded by gardens that you can see above. 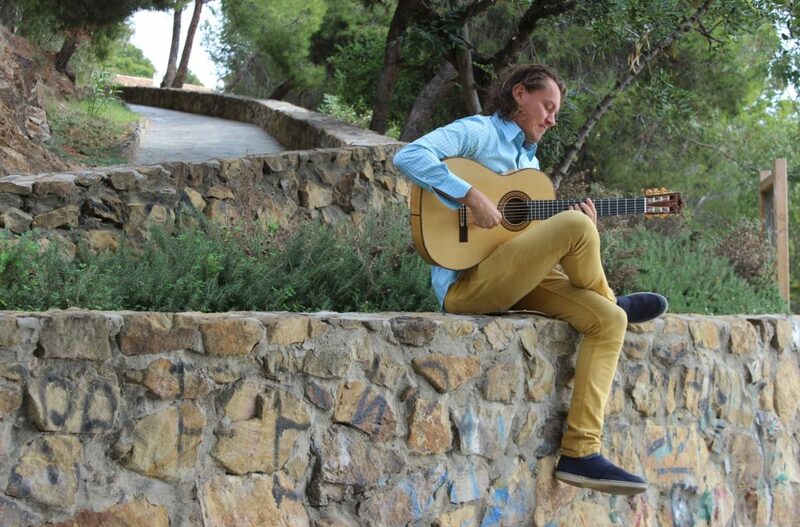 Along the very pleasant winding path to Malaga center we paused at a mirador where this handsome guitarist was playing selections from Enrique Granados’ “Goyescas,” Los Majos Enamorados one of my favorite pieces of quintessentially Andalusian music. 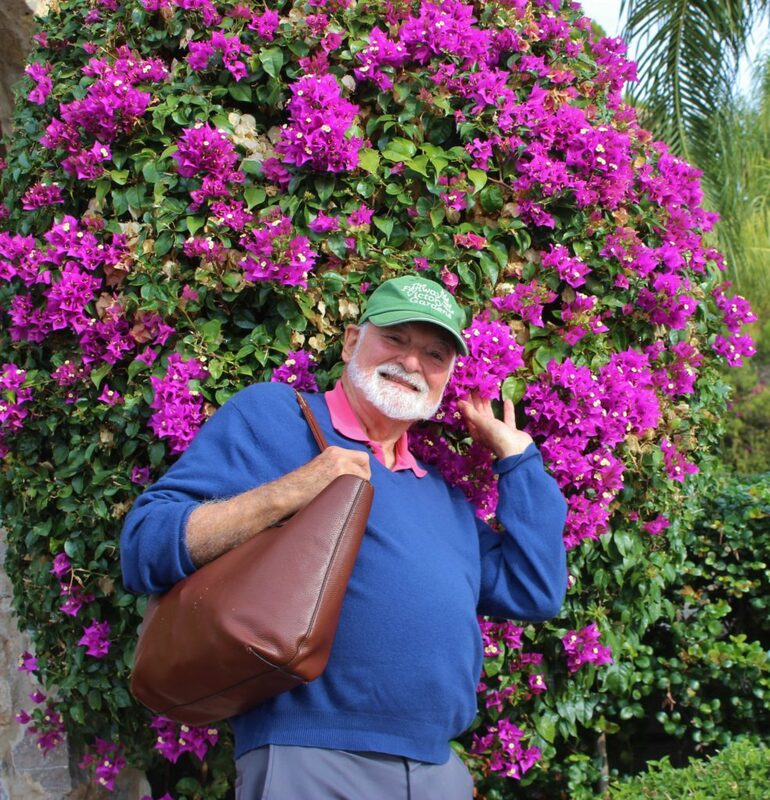 I am so glad we mustered up the energy for this walk into town because every step was a miracle of tumbling gardens with every imaginable variety of flower tree and vine, many in bloom and all beautiful. As we approached the rose garden and orangery surrounding the city hall at the bottom of the hill, we came across neighbors walking their dogs and exchanging gossip with animated gestures while the canine contingent patiently awaited their respective masters to pipe down and get on with it. I like the guy’s coat that ingeniously reveals a light gray tweed pattern drifting like a cloud from the background of what looks to me like the soft black cashmere wool. Can I say that the effect echoes his beard and cropped hair? 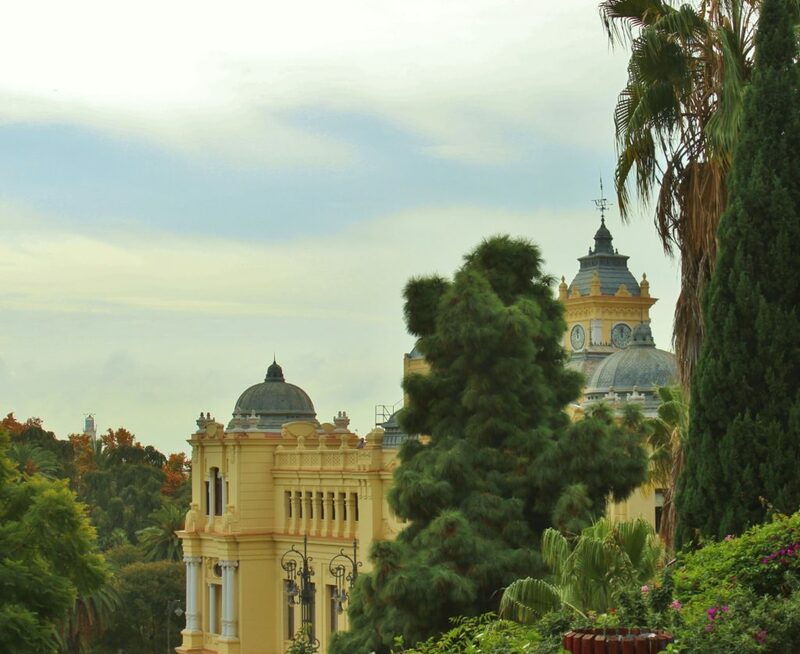 Peeking out from lush foliage of Mount Gibralfaro gardens tumbling down the hill side we glimpse Malaga’s stately town hall. 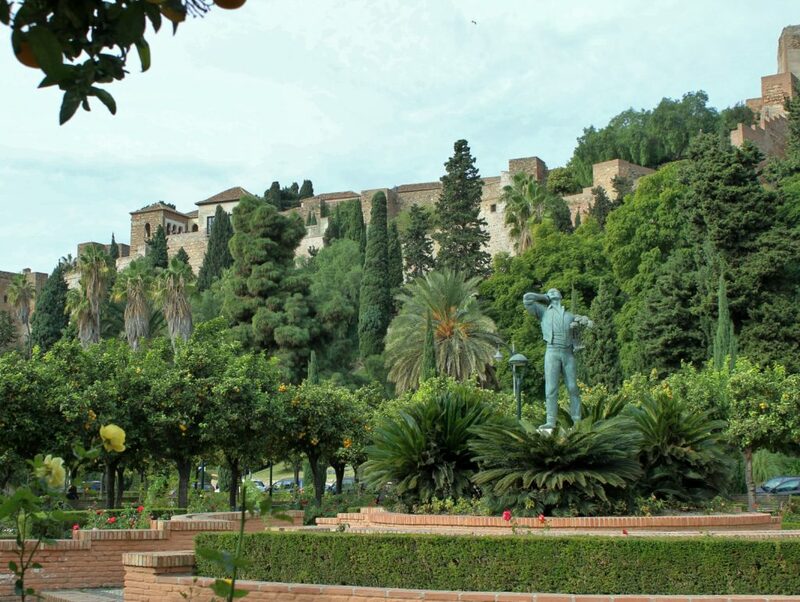 Here we see a view of the The Alcazaba peeking out from the surrounding woods of Mount Gibralfaro as seen from the rose garden at the bottom of the hill. The Alcazaba is a palatial fortification of Málaga originally built by the Hammudid Moorish dynasty in the early 11th century and it was respectively built on the ruins of earlier Phoenician and then Roman fortifications that extend all the way up to the summit and Castillo de Gibralfaro. 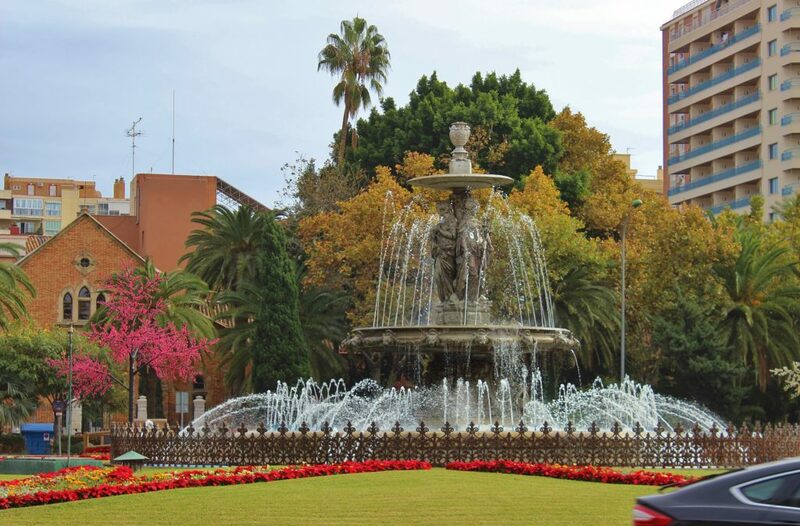 Punctuating a traffic round-about at the head of the rose garden by the town hall, this enormous fountain with its surrounding park full of impressive trees creates a pleasant relief to modern Malaga apartment towers crowding the Plaza de Toros neighborhood. 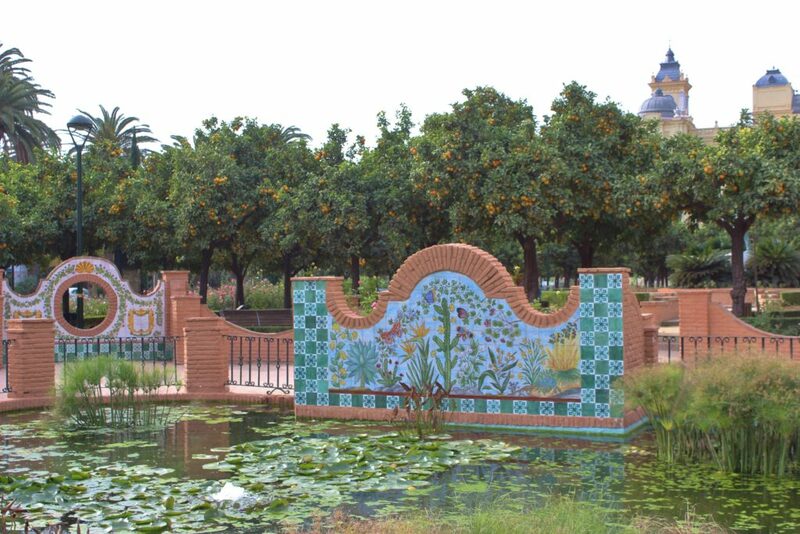 At the center of the rose garden is a lily pool and these tiled wall murals which are actually the backs of built in benches that face the rose beds. 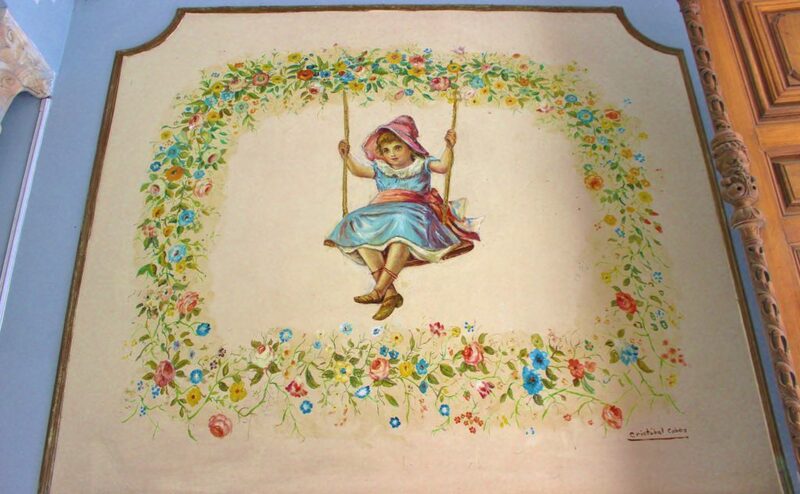 This mural includes flora and fauna with a towering cactus at the midpoint and a flutter of colorful butterflies hovering about a scattering of flowers. 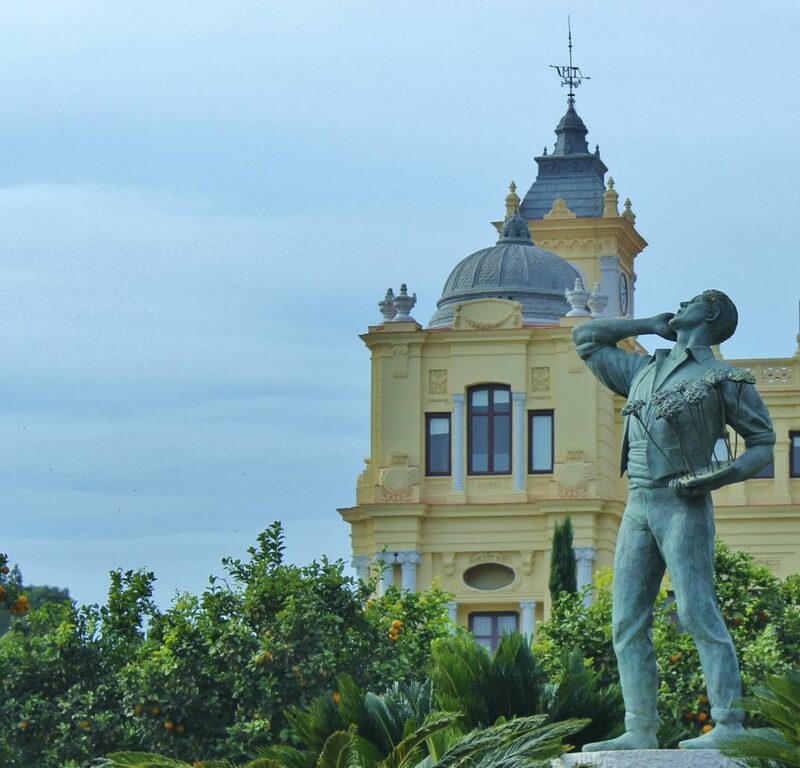 “El Biznaguero” is a bronze sculpture by Jaime Fernández Pimentel (1963) which enjoys pride of place at the center of the Pedro Luis Alonso Gardens next to Malaga town hall. Here we see the tops of orange trees softening the grandeur of the domed towers. El Biznaguero is a street vendor who sells Biznagas, a traditional bouquet of fragrant jasmine blossoms woven into the dried flower heads of ammi visnaga a kind of wild carrot which I would call Queen Ann’s Lace. These arrangements have become a symbol of Málaga so much so that even the Málaga Spanish Film Festival awards a silver or gold plated Biznagas to the winners. Approaching Málaga Cathedral from the north façade we can see one of the two distinctive towers of the north transept standing to each side of Puerta de las Cadenas or door of the chains (see lower middle photo, column with chain) this demarks the place of asylum for those individuals seeking protection of the church against civil law. 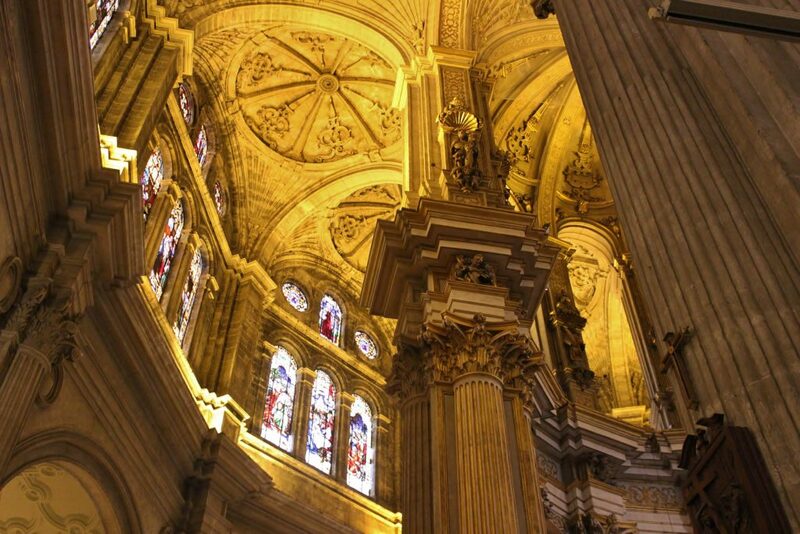 It also serves as the entrance to the transept of the Cathedral. Beyond this is the one completed monumental bell tower of the west front or main ceremonial entrance to the Cathedral. 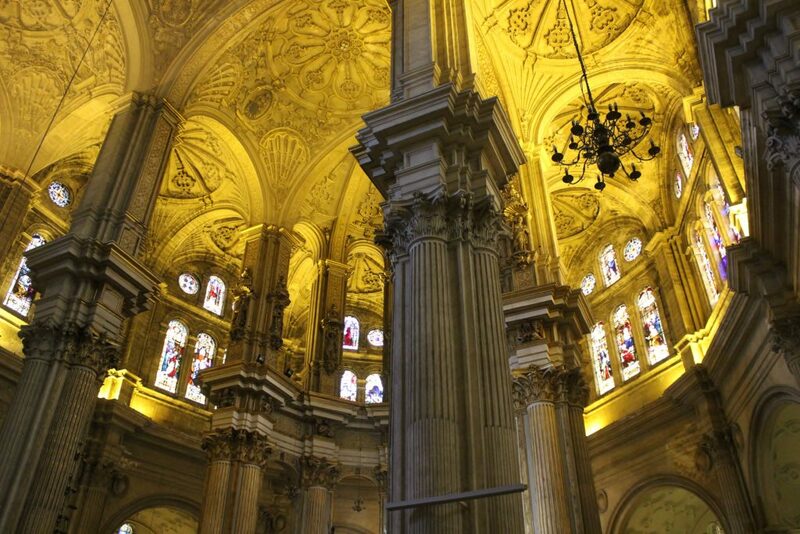 The interior of Malaga Cathedral built over two and a half centuries 1528 – 1782 and has a soaring multi-domed ceiling upheld by clusters of Corinthian columns extended by supports holding aloft the beautiful vaults decorated with scallop shells in the corners. 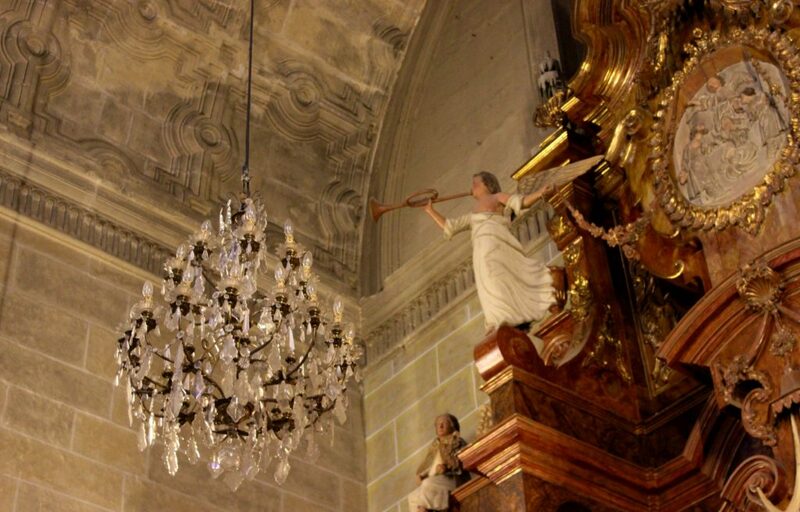 If you know me, you’ll probably know that I am a sucker for trumpeting angels and crystal chandeliers. 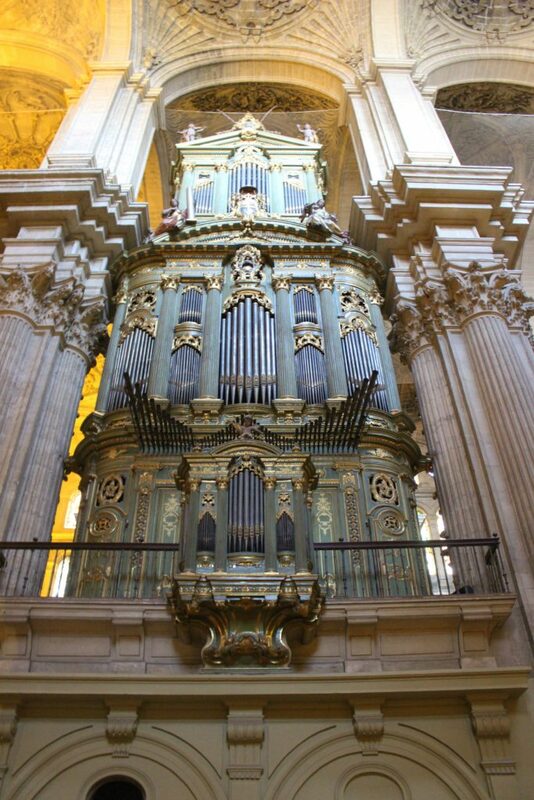 The choir of Malaga Cathedral (1633-1660) is a great Baroque wonder, carved from Mahogany, cedar and red granadilla woods all from the new world. 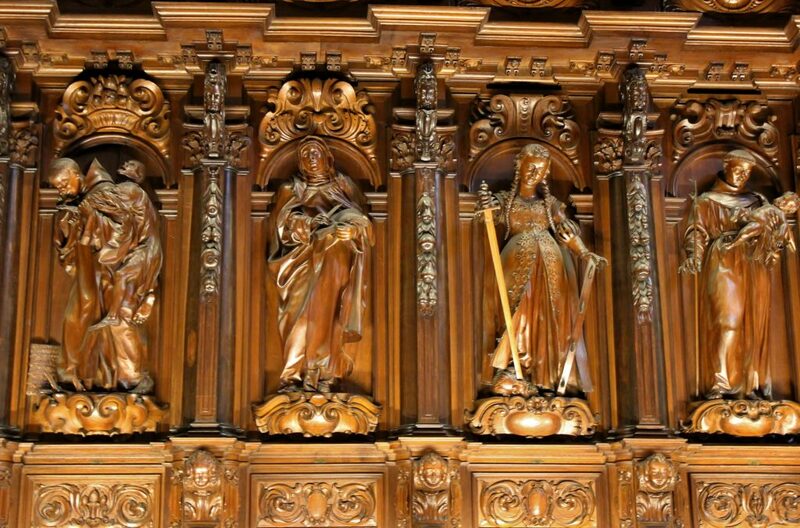 The animated character of each sculpture pulses with life and exalted emotion depicting, apostles, saints and martyrs and doctors of the church. Soaring over the choir stalls are two organs in architectural cases that reach to the limits of the vaulted ceiling. Before we leave Málaga let’s let Baby Pip-Squeak get the last word, “Green is more than a color, it’s is a philosophy!” And boy ain’t that the truth. I caught B.P.S. 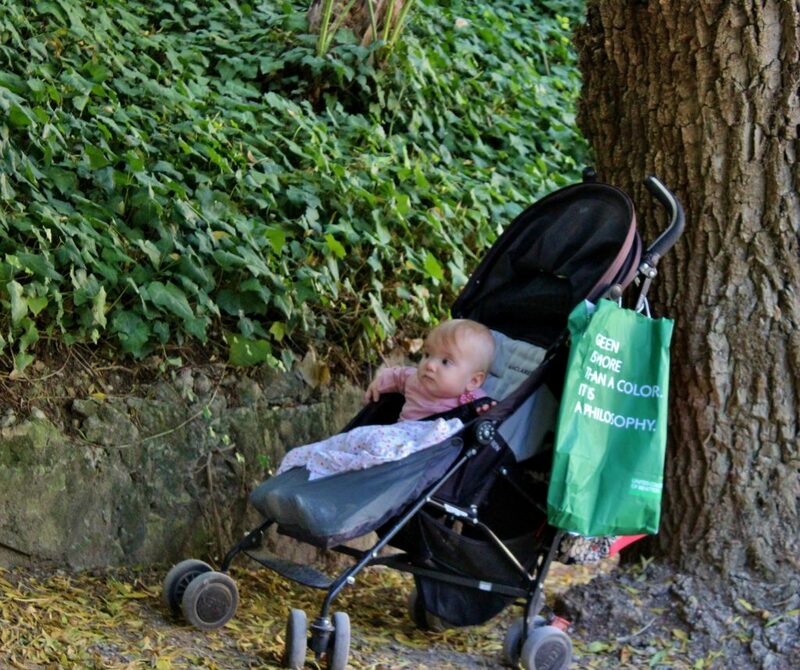 in the Málaga Botanical Garden where she was spreading the good news. Rock on Squeak!! This entry was posted in Malaga 2017, World Travel on May 3, 2018 by ioryallison3.